The Taxiplane and the Trainer were basically the same aircraft, the former accommodating a pilot forward and two passengers side-by-side aft and the Trainer two in tandem. Power for both was an 89.4 kW (120 hp) Bristol Lucifer engine. 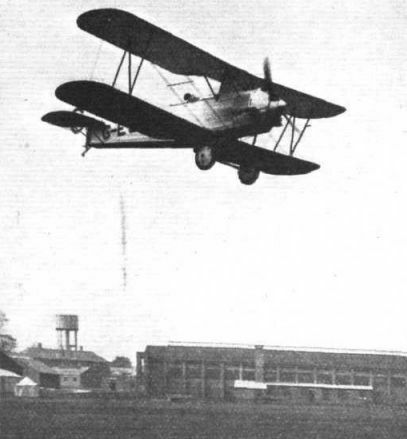 Only three Taxiplanes were built, but 24 Trainers were produced for use at the Bristol RAF Reserve Officers’ Flying School, and for export to Chile, Bulgaria and Hungary. SIMPLICITY of construction and a minimum of parts subject to wear are the special features of the new "Bristol" three-seater biplane which has just been produced by the Bristol Aeroplane Company, Ltd., of Filton, Bristol. In getting out the design of this machine, Mr. Reid, chief designer to the firm, endeavoured constantly to keep in mind the fact that, as the machine was intended for the owner-pilot, it was essential that everything which was likely to require attention should be as simple as possible, and that the number of parts that were at all likely to wear out should be reduced to an absolute minimum. Besides these desiderata, any such machine should, it was thought, be capable of carrying two passengers in addition to the pilot, and should be able to do so with the lowest horse-power consistent with a reasonably good performance. The outcome was the new Bristol three-seater, and in the following notes and illustrations we shall attempt to show the manner in which the designer attacked the problems he had set himself. As regards the machine itself, the lines will be clear from the accompanying scale drawings and photographs. It is a heavily-staggered biplane, with only one pair of inter-plane struts on each side. The fuselage is fairly wide in proportion to its depth, and the two passengers are seated side-by-side in a cockpit aft of the pilot's. 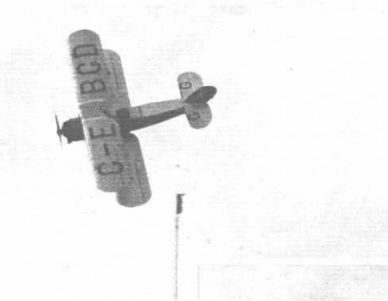 The latter, owing to the heavy stagger and the small obstruction formed by the "Lucifer" engine, has a particularly good view forward and downwards, while the close proximity of the two cockpits makes it possible for the passengers to carry on conversation with the pilot. The main characteristics of the Bristol three-seater are as follows: Length over all, 23 ft. 6 ins. ; span, 31 ft.; height, 8 ft. 10 ins. ; wing area, 291 sq. ft.; weight, empty, 1,210 lbs; petrol (25 galls.) and oil (3 galls. ), 215 lbs. ; pilot, 180 lbs. ; two passengers, 320 lbs. ; luggage, 75 lbs. ; total loaded weight, 2,000 lbs. ; power loading, 20 lbs. /h.p. ; wing loading, 7 lbs./sq. ft.; speed at ground level with full load, 90 m.p.h. (without passengers and luggage 93 m.p.h. ); speed at 5,000 ft., with full load, 88 m.p.h. (without passengers and luggage, 91 m.p.h. ); climb to 1,000 ft. with full load, 2 minutes; cruising speed, about 75 to 80 m.p.h. ; landing speed, about 40 m.p.h. THE new "Bristol" Lucifer school biplane is a strong and up-to-date machine, excellently suitable for instructional purposes, and so simple and strong in design and structure as to withstand hard service and constant use without much attention or depreciation. In addition to many special features, special attention must be drawn to the great reserve of power which has been provided for. From the figures given in the specification it will be seen that the total loaded weight is 1,700 lbs. The British Air Ministry's Certificate of Airworthiness, however, specifies that a load up to 2,140 lbs. may be carried. The 100 h.p. "Bristol" Lucifer engine is the power unit used. This is not only an engine of great reliability and simplicity of design, but as an engine of modern type it allows of the pupil gaining valuable experience of radial engines during the period of instruction. The consumption of this engine at cruising speed is extremely low, amounting to about 5 gallons of petrol and 2 pints of oil per hour. A starting handle is fitted to the Lucifer engine, so that the trouble, waste of time and danger of propeller swinging is entirely obviated. The petrol is provided from a scuttle tank fixed in front of the pilot, and is fed by simple gravity, a large and easily demountable filter being fitted. The unusual simplicity of the petrol and oil systems also calls for remark. In order to eliminate any possibility of danger from fire, steel fireproof bulkheads are fitted behind the engine, and all control connections pass through fireproof glands. Carburettor intakes are carried through the bottom side of the engine cowling, thus eliminating any possibility of the accumulation of petrol. The upper and lower wings are identical and interchangeable, and are of the single bay type. This arrangement is not only convenient, but reduces the spares which should be carried. The interplane struts, and those carrying the centre section, are of "N" formation, and require no trueing up. An oleo-steel spring chassis is fitted, the oleo plungers having a special type of tapered needle valve controlling the passage of the oil through the plunger and giving constant oil pressure throughout the stroke of 8 ins. The fitting of an oleo chassis, of course, helps considerably to reduce the risk of damage by reason of indifferent landings, whilst it also materially tends to lengthen the life of the machine. The tail incidence can be varied by a lever quadrant to trim the machine under all conditions of speed and load distribution. In the separate cockpits provided for pilot and pupils dual sets of controls are fitted, whilst the instruments are also duplicated. Communication between the cockpits is by telephone. The specification of this machine, which, as regards its general outline, resembles the Bristol taxiplane, is :- Span, 31 ft. 2 ins. ; length, 24 ft. 4 ins. ; height, 5 ft. 10 ins. Weight empty, 1,180 lbs. ; pilot and pupil, 360 lbs. ; petrol (15 galls. ), 110 lbs. ; oil (2 1/2 galls. ), 25 lbs. ; equipment, 25 lbs. ; total weight, 1,700 lbs. Weight per h.p., 17 lbs. ; weight per sq. ft., 6 lbs. Speed at ground level, 95 m.p.h. ; speed at 6,500 ft., 92 m.p.h. ; speed at 10,000 ft., 90 m.p.h. Climb to 1,000 ft., 1 min. 40 secs. ; climb to 6,500 ft., 13 mins. Fuel consumption at cruising speed : petrol consumption, 5 g-p-h.; oil consumption, 2 pints/hour. 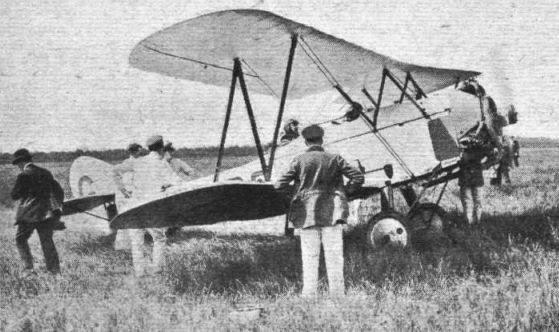 THE "BRISTOL" THREE-SEATER: Three-quarter front view. THE "BRISTOL" THREE-SEATER: Three-quarter rear view. THE "BRISTOL" THREE-SEATER: Front view. |The man standing in front gives a good idea of the size of the machine. THE "BRISTOL" THREE-SEATER: View showing how engine mounting is swung out to give access to back of engine. 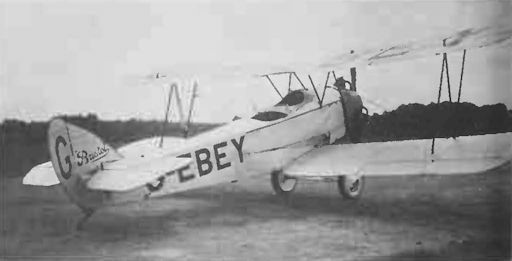 Taxiplane G-EBEW was the first of its type, intended as an economical three-seat general utility aeroplane using the Bristol Aeroplane Co’s 100 h.p. Lucifer three-cylinder radial engine. 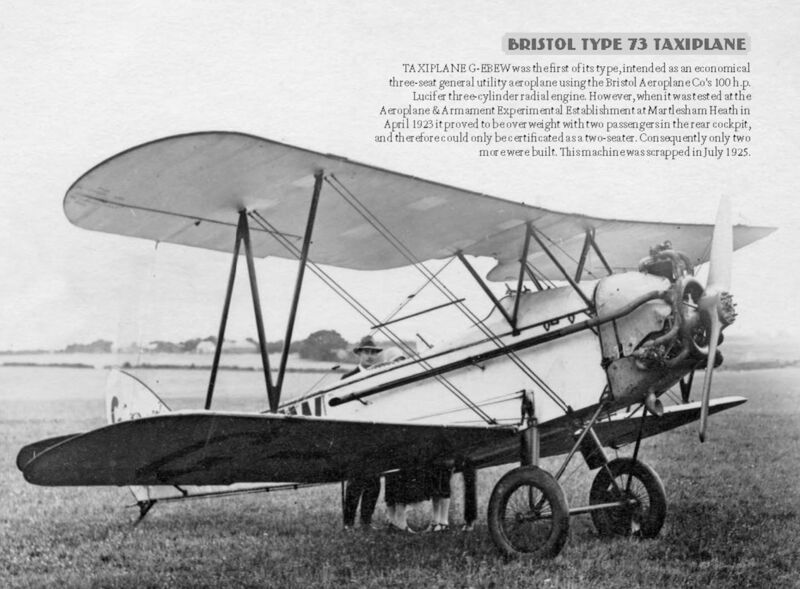 However, when it was tested at the Aeroplane & Armament Experimental Establishment at Martlesham Heath in April 1923 it proved to be overweight with two passengers in the rear cockpit, and therefore could only be certificated as a two-seater. Consequently only two more were built. This machine was scrapped in July 1925. 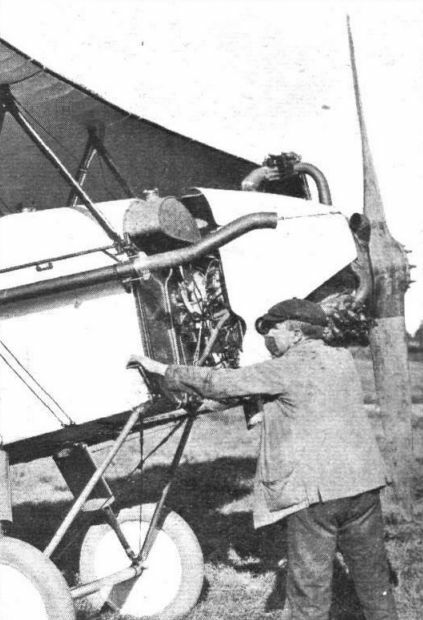 THE GROSVENOR CHALLENGE CUP: On the left, C. F. Uwins about to start on Sir Henry White-Smith's Bristol "Taxi-'plane" (100 h.p. Bristol "Lucifer"), after having set his watch to official time. The "Bristol" Lucifer School Machine: Three-quarter front view. A row of "Bristol" school machines, fitted with three-cylinder Bristol "Lucifer" engines. SOME OF THE LARGER MACHINES AT LYMPNE: From left to right, the Avro-Lynx, Bristol "Lucifer," Bristol "Bloodhound," S.E.5, Sopwith "Gnu," A.D.C.l, and a sky-writing S.E.5. BRISTOLS IN CHILE: For some time past the Chilian Air Force has been employing a number of Bristol-Lucifer School machines with highly successful results - both as regards machine and engine. We show above a picture of a formation of seven of these Bristol-Lucifer 'buses at an Air Display held last September at El Bosque Aerodrome, near Santiago. 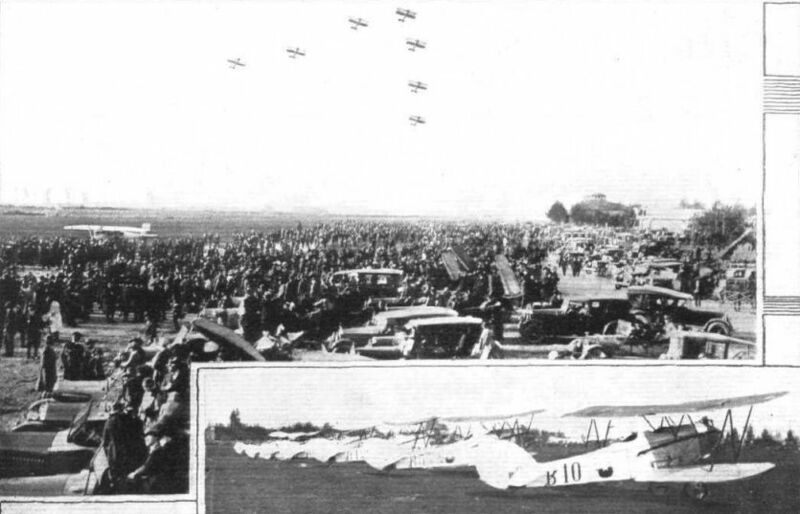 Below, the seven machines are shown lined up on the aerodrome. Holmes on the Bristol "Lucifer." 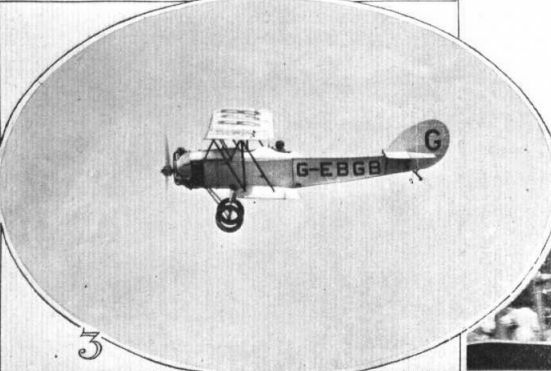 THE BRISTOL FLYING .MEETING: 3, Mr. Campbell, on the "Bristol-Lucifer" training machine. Winning the Talbot O'Farrell Race: Mr. Uwins crossing the finishing line on his Bristol "P.T.M." biplane with Bristol "Lucifer" engine. His average speed was 109 m.p.h. SOME MORE COMPETING MACHINES: The Bristol 83E (Bristol "Titan I") piloted by Sqdn.-Leader A. G. Jones-Williams. The "Bristol" training machine is fitted with the new "Titan" engine, which is composed in the main of "Jupiter" parts, and has five "Jupiter" cylinders. 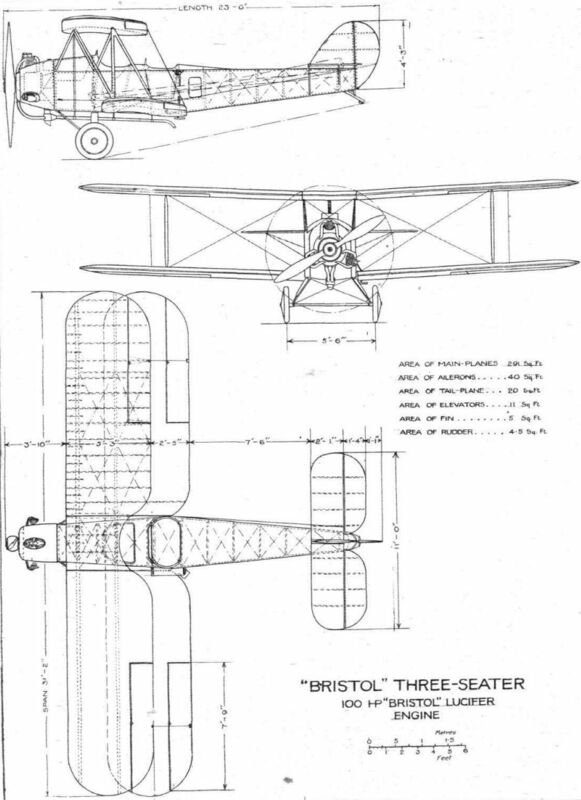 THE "BRISTOL" THREE-SEATER: Details of the swivel mounting of the 100 h.p. "Bristol" Lucifer engine. 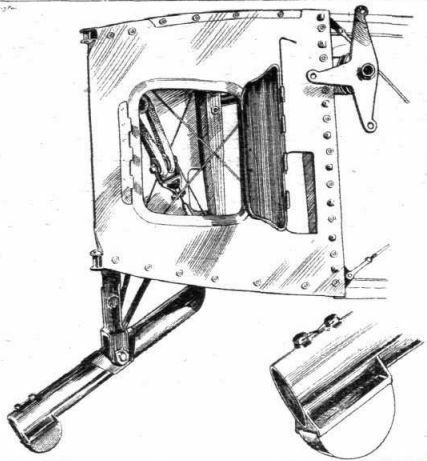 THE "BRISTOL" THREE-SEATER: Details of the tail skid and its mounting. On the right may be seen one of the horizontal "T" cranks of the tail-trimming gear. Inset shows the renewable shoe of the tail skid. 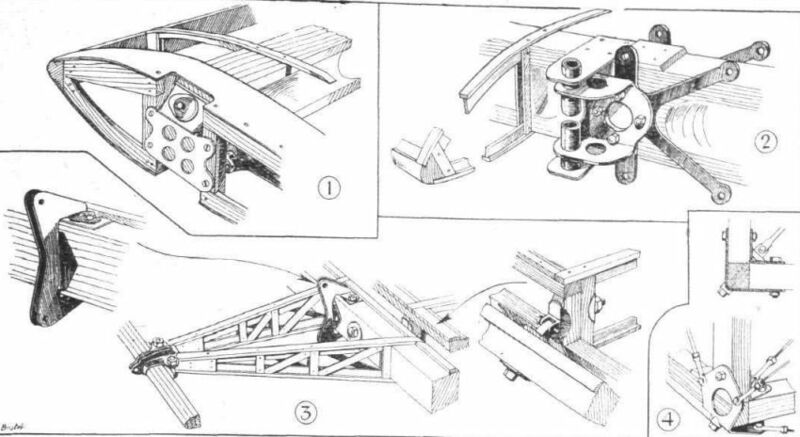 THE "BRISTOL" THREE-SEATER: Some constructional details. 1, Spar fitting on top plane. The eye bolt engages with a forked end on the centre-section spar. 2, The bracket and bearings, on the front spar, for the cranks which are used instead of pulleys. 3, Details of aileron construction and fittings. Inset: Aileron hinge. 4, A typical fuselage fitting. 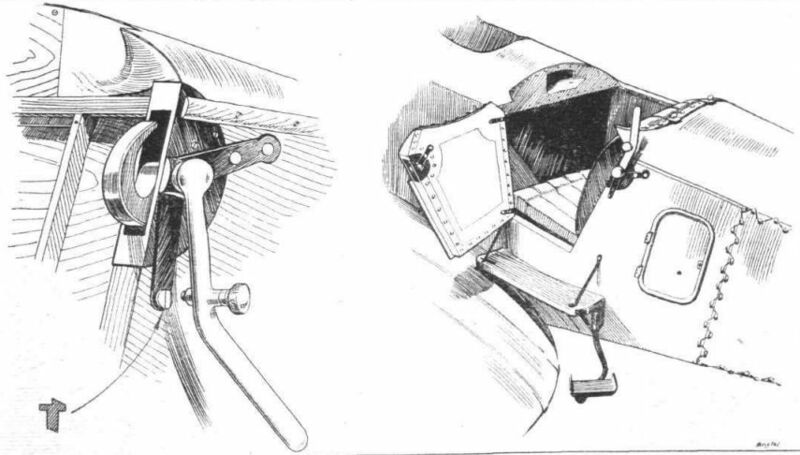 THE "BRISTOL" THREE-SEATER: On the left, a diagrammatic representation of the aileron controls, in which use is made of cranks in place of pulleys. 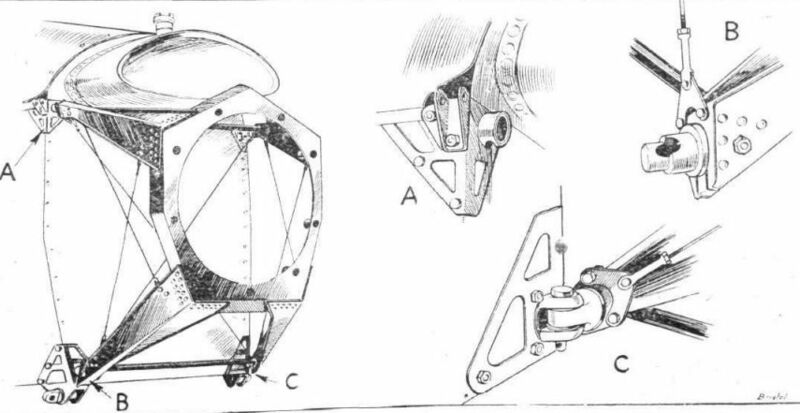 On the right, a diagram of the tail-trimming gear. The tail plane is hinged on its leading edge, and the trailing edge is moved up and down by horizontal "T" cranks and short struts.